The Russian Blends in The Irresistibles! set bringing together 8 exclusive blends. These recipes have remained secret since they were created in the 19th century. 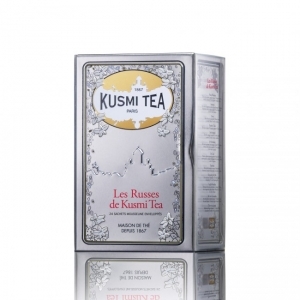 24 individually envelopped muslin tea bags for trying Kusmi’s exclusive Russian taste, the result of bringing together single origin teas and flavours based on Earl Grey. Prince Vladimir, Anastasia, Kashmir Tchai, St. Petersburg, Bouquet of Flowers N°108 and Christmas tea. Also try Imperial Label and Green St. Petersburg, two green tea-based blends inspired by exclusive blends.